It took an afternoon and a morning to finish but our Christmas decorations have been carefully packed up and stored away for another year. The house has been vacuumed and furniture returned to its proper place in rooms. It always looks a little bare once decorations are removed but it was time to break down boxes for recycling, get the trash to the street for pickup tomorrow, and mentally start planning for the new year. One decoration that I had great fun with this season was dried oranges. I’ve loved to use dried slices to make wreaths, ornaments, and gift adornments. I’ve dried the oranges in my old oven with varying luck. Using the lowest possible heat setting of 175°, oranges had to be watched carefully and turned over a couple of times, and it took hours. The end result varied greatly. Many developed black or scorched areas and had to be discarded. It was so easy that I went overboard this holiday and made so many dried oranges that I had to give them away by the bag full. It was just too easy and fun to dehydrate this year. The slices were practically dry in 2-hours. I moved on from oranges to lemons and nectarines and hung them as ornaments on one tree and as orange slice swags on the other. 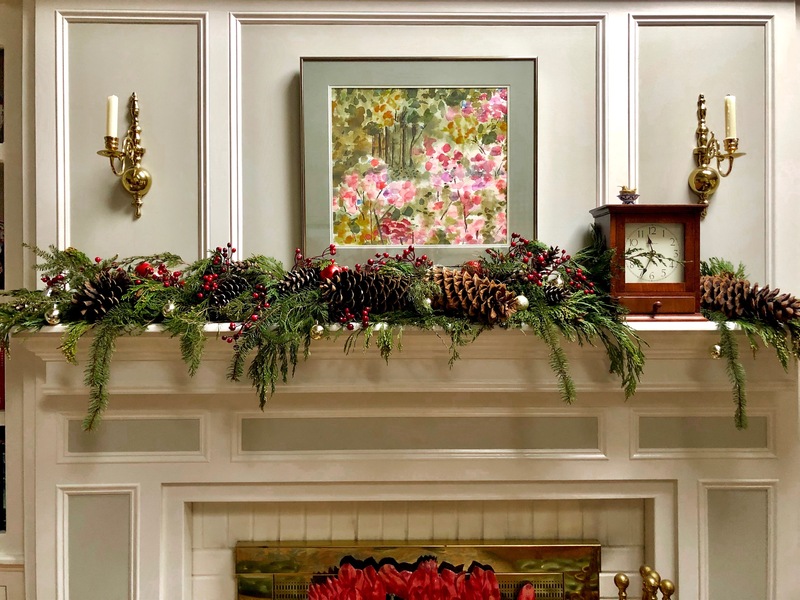 I them tucked into the evergreens on the sideboard and mantle and into the arrangement on the dining room table. I held a Christmas floral design workshop for our garden club and took a Ziploc bag of dried oranges for anyone to use. Some did. Most did not. So it was at that workshop while I was re-bagging the leftover oranges that a friend asked, “Have you ever used dried oranges and lemons in tea?” What???? It was such a simple suggestion that turned out to be an extraordinary one for me. It had never occurred to me to re-hydrate the slices of lemons and oranges in a steeping cup of tea. I just might have a use for all those oranges after all. I tried it as soon as I got home. And guess what. It works…. it’s delicious…. it’s brilliant…. it’s simple…and I thank you, Becky, for the suggestion! A brother in Virginia emailed this fall that he was beginning to build another outbuilding that he designed. He’s the brother who designed and built two other outbuildings in their beautiful landscape. If you’re interested in checking them out, I boasted posted some words and photos about this one and about this one in earlier blogs. The original one is the largest and has a pull-down ladder to an attic large enough to stand up in. He designed it after seeing one like it in Williamsburg VA, our hometown. The second one, built to mirror the first one, is smaller and houses his lawn mower, trimmer, and other gasoline powered equipment. Not too long ago he said he needed an even smaller outbuilding to house the whole-house generator he purchased after going through Hurricane Florence. Really? Another outbuilding? It seemed to me that with one emailed photo he was starting to construct the building and the following email a couple of weeks later was full of photos of the painting of the finished product. He designed the smaller generator shed to match the other two on the far side of the home with his ‘signature 8/12’ roof. The louvered doors taken from a large estate were found at a local salvage dealer… a dealer who knows him by name by now as he’s been a steady customer through the years. I have not seen this latest outbuilding in person and was a little confused where the heck it exactly sat on their property. He answered that it’s located right where a 40-year old boxwood was located…. a huge shrub I do remember…. that he dug up and moved to a spot front yard. Oh my! He just shared a photo of his new generator outbuilding from his window after a mid-Atlantic snowstorm blanketed the area. The generator outbuilding is the showpiece he hoped for and truly looks as though it’s been there since colonial days. I’m proud of this talented bro and boasted posted about him and my sister-in-law here and here, too. I’m a lucky gal. Every year I debate whether to put up a live Christmas tree or an artificial tree. I have live greens indoors festooning the tops of mantles, sideboards, tabletops. 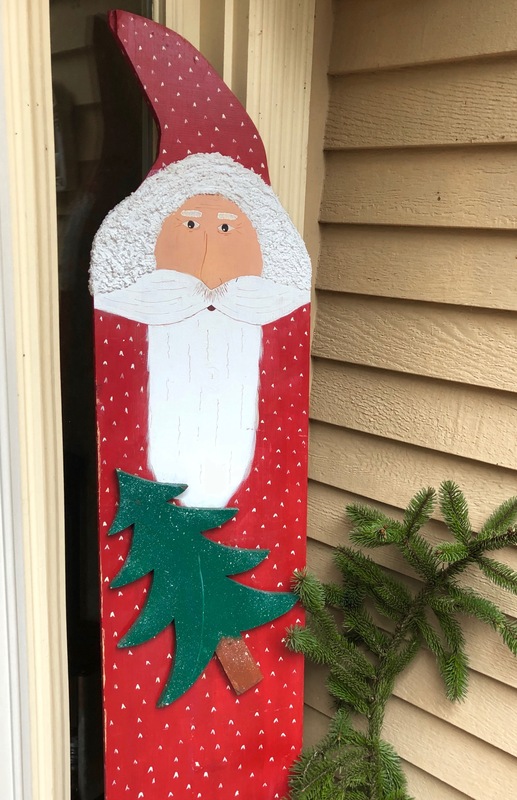 Outdoors, I always put out our big painted Santa, a live wreath on the door and a small evergreen tree covered with winterberries that the birds will eventually eat. But I wrestle with the tree decision every year. Since Thanksgiving day, I have spotted lovely Christmas trees through living room windows as I drive in the evening. I want to have ours up and decorated now, too. The problem is I love a fresh tree…but putting it up now for me guarantees a dry, brittle tree with faded needles, drooping branches, dropped needles and decorations askew by Christmas Day. And when the tree is taken down, more fallen needles have actually clogged the vacuum in years past. Needles can hide in places that I discover months later. I’ve tried all the tricks to keep a tree moist. None have worked. Every other year I’m certain I’ve solved that problem by buying an authentic looking artificial tree, but by the next year I’ve fallen out of love with anything artificial. I’ve given a lot of artificial trees away. One realistic one sat full of lights in my mother’s home. One is decorated yearly at my brother’s home and another one completes multi-tree holiday decor in my daughter’s home. The one I bought last year, a cute tabletop lifelike tree, sits in a box in the basement. I liked it last year but I can’t even bear to open the box now.